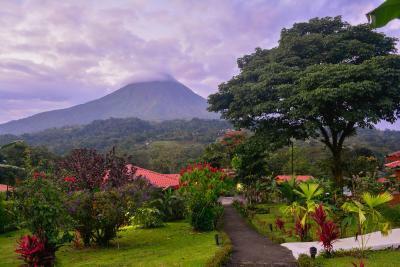 Lock in a great price for Miradas Arenal Hotel & Hotsprings – rated 8.9 by recent guests! Deck with view, grounds, hot springs pool, staff, room was comfortable. 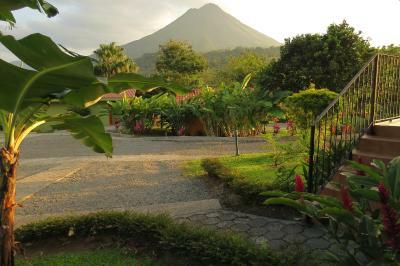 volcano view, the variety of birds and wildlife.p, the hot springs, beautiful grounds and relaxing atmosphere. Breakfasts were good and beautiful views from restaurant. Nice friendly service. Wonderful experience. 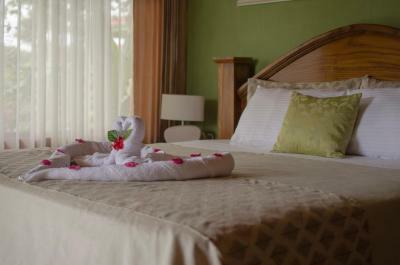 Beds were super comfy, shower was modern and fancy, awesome A/C (you don’t really need it, though), AMAZING staff, swim up bar in hot spring pool, gorgeous views- Close Arenal view LITERALLY outside on our private deck in private bungalow!! Included breakfast was a menu, cooked to order in the breathtaking open air restaurant. Best gallo pinto I had on trip! We went for a girls’ trip, and definitely want to bring my husband back! Beautiful! Loved having our own little cabin. The pool and hot spring bar/restaurant was amazing. So many birds and and beautiful plants. The staff was so helpful too. They have a restaurant on the property, as well as a nice bar. 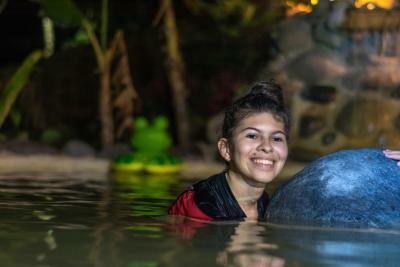 Two swimming pools, one had a swim-up bar that was hot spring fed, and the other was a cool temperature pool. Lovely grounds and very quiet. It's away from the heart of the city center of La Fortuna, but we like it that way. The bungalows were far away from the main road and it was a very safe location. Our shower had a huge window (with a shade for privacy) so you could shower with the volcano in view! The unobstructed view of the volcano was spectacular! Cattle grazed on the grass field leading up to the property. The staff was very nice and helpful. We loved the resident pup who came to visit the restaurant. 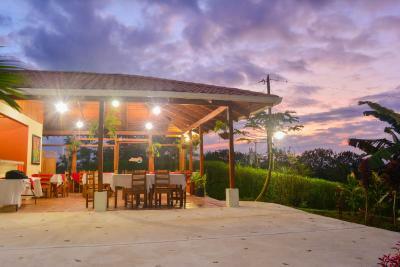 This is a nice and quiet place with a beautiful view of the Arenal volcano. The staff was great and very accommodating. On two separate days they opened their restaurant early just for us so we could eat before our tour picked us up! The location and view was great! The staff was friendly! View was amazing from the room, pool area and restaurant. Beds were really comfortable. Saw tons of birds during breakfast and an iguana on the property. 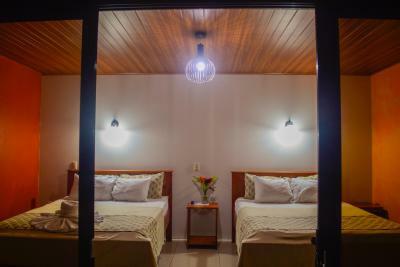 Hotel is about 13 minutes from downtown La Fortuna so it’s close enough for convenience if you have a car but far enough removed that you get some peace and quiet. 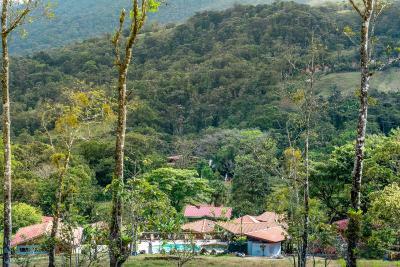 It’s also half way between La Fortuna and the national park, hanging bridges park, etc. 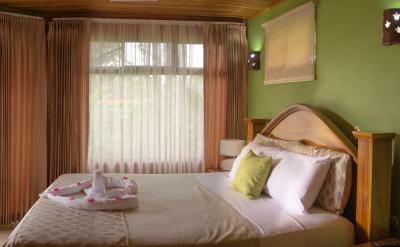 The room has a wonderful view, it's very clean and nice. The staff were very friendly and the place was awesome. Great breakfast. 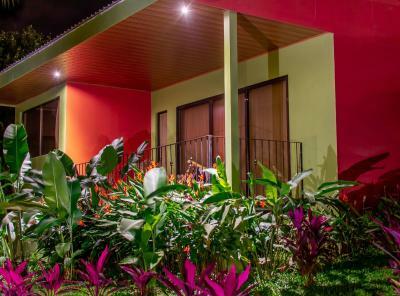 Miradas Arenal Hotel & Hotsprings This rating is a reflection of how the property compares to the industry standard when it comes to price, facilities and services available. It's based on a self-evaluation by the property. Use this rating to help choose your stay! One of our top picks in Fortuna.Featuring views of El Arenal volcano, Hotel Miradas Arenal has a garden and an outdoor swimming pool. Free Wi-Fi access and free parking are available. 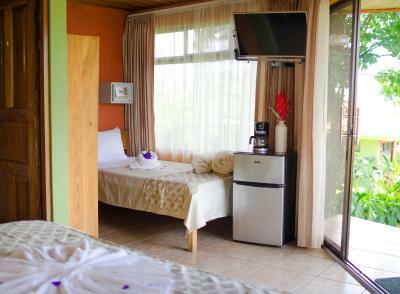 Arenal Miradas’ air-conditioned bungalows all feature a safe, a refrigerator, a coffee machine and a TV with cable channels. The terraces feature mountain views. 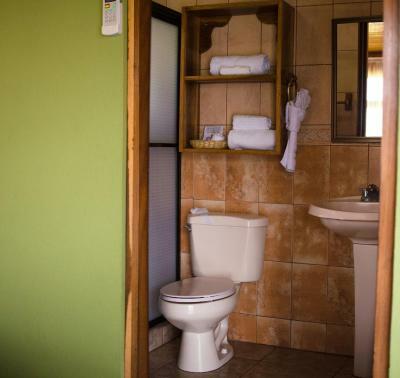 Including a shower, the private bathrooms each have a hairdryer. Breakfast is included in the room rates. The on-site restaurant is open for breakfast service. Some restaurants can be found within walking distance of the property, less than half a mile away. Other facilities include a tour desk and a laundry service. Arenal Volcano National Park is 6 miles away, and Juan Santamaría International Airport is 48 miles away. 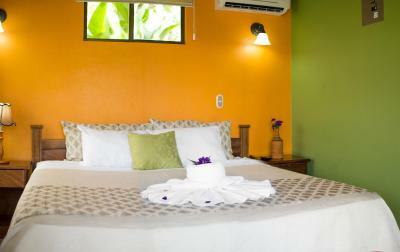 When would you like to stay at Miradas Arenal Hotel & Hotsprings? 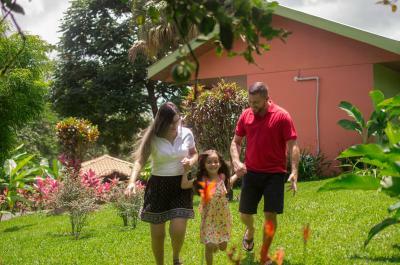 This air-conditioned bungalow features a romantic atmosphere, a safe, a refrigerator, a coffee machine and a TV with cable channels. The terrace provides mountain views. 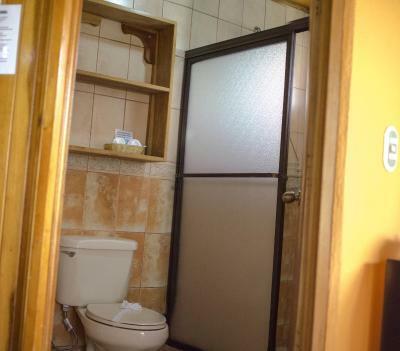 This air-conditioned bungalow features a safe, a refrigerator, a coffee machine and a TV with cable channels. 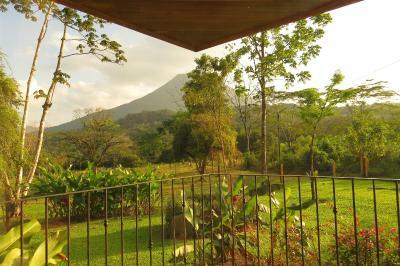 The terrace provides spectacular views of Arenal Volcano. 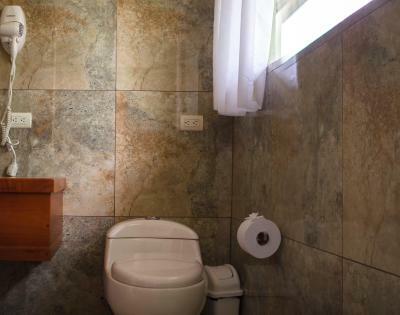 This bungalow features a cable TV, patio and tile/marble floor. 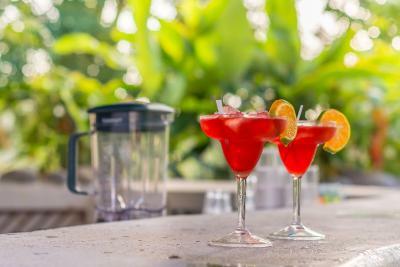 House Rules Miradas Arenal Hotel & Hotsprings takes special requests – add in the next step! Miradas Arenal Hotel &amp; Hotsprings accepts these cards and reserves the right to temporarily hold an amount prior to arrival. Miradas Arenal Hotel & Hotsprings accepts these cards and reserves the right to temporarily hold an amount prior to arrival. 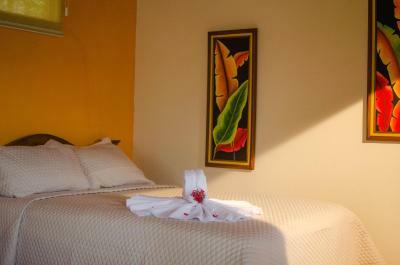 Please inform Miradas Arenal Hotel & Hotsprings of your expected arrival time in advance. You can use the Special Requests box when booking, or contact the property directly using the contact details in your confirmation. 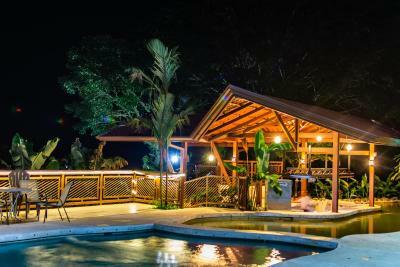 Gorgeous view of Arenal volcano and beautiful thermal pool with swim-up bar. Lots of birds including toucans! Good breakfasts. Comfortable room. Bathroom was a bit smelly but not too bad. Not much storage space. View of the volcano was amazing. Plenty of birds flying round and beautiful grounds. Beds were comfortable. Swimming pool was lovely - the hot springs pool was great and the pool bar nice. Breakfast was good and we had dinner one evening which was also good. Woken by howler monkeys and birds was fun! Very relaxing place. We stayed in bungalow number 1. 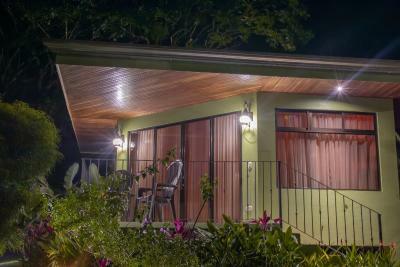 The bungalows were beautiful and spacious and the shower has a view of the volcano! 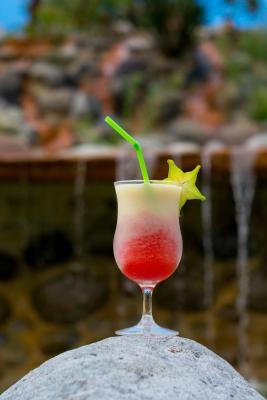 We loved the breakfast, go for the traditional Costa Rican one and you won’t be disappointed. Incredible views of the volcano from the pool, thermal one was emptied the day we were there and re filled, it’s thermal water so is murky but so warm! 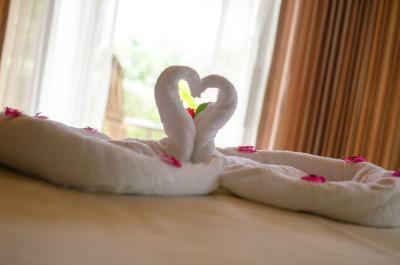 Staff were lovely and friendly, nice touches like fresh coffee in the rooms each day. You will be woken up early by the birds and animals but it was such a beautiful wake up call! We had a car which was great so we could drive into town for meals, it’s such a great location 15 minute drive from La Fortuna waterfall, the hanging bridges and we kept driving and discovered Lake Arenal which was stunning! Bed was very comfy, perfect start to our Costa Rica adventure and a great place to acclimatise and get rid of our jet lag! Thank you for an incredible stay! Dining room food was limited and ordinary. Fortunately we had a car to go out for dinner the 2nd and 3rd evenings. Our bathroom needed more light over the sink for people like me who need it to put contact lenses in. discoloration of hots springs water even though we know it is clean and well maintained, the color of the water in not so inviting. May not be able to change it but we still enjoyed the experience and views. The breakfast was served and I considered the servings too small (even the typical version with quite filling gallo pinto). 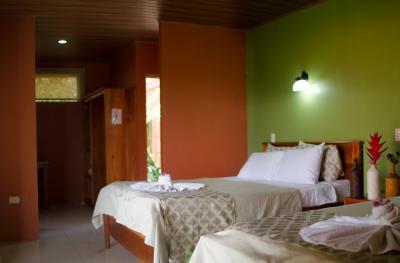 compared to other 4 places where I stayed in Costa Rica. I had the feeling that the bed sheets were either not fresh or stored somewhere for a long time (lacked characteristic smell of a fresh laundry), however I wasn't 100% sure about that to make a fuss about that considering staying there for just 2 nights. 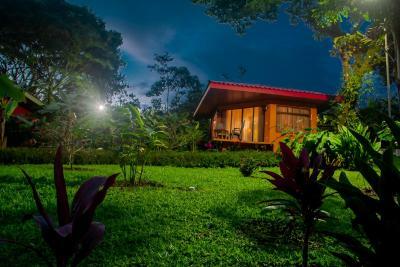 Very good location - about halfway between La Fortuna town and Parque Nacional Volcan Arenal. 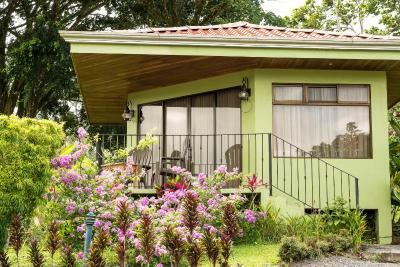 Bungalows have clear view on Arenal Volcano (however it is often at least partly behind clouds). Nice pool with water from the hot springs that allow to relax after a long hike. Different types of breakfast to choose from. Very friendly and informative staff at the reception desks - they are locals, know the area and can give very good advices and accurate information. Room was OK - pretty basic and small but had TV (which is not that obvious in CR). Nothing special but also nothing to complain about. Beautiful setting, clean room, super helpful, friendly staff. A little too far from town (we didn't have a car). Food wasn't great. Peace and quiet. Beautiful gardens. Staff v helpful and friendly. Pool. Not enough lighting in the room. No hooks to hang towels. It took very long to get hot water in the shower. The trees and vegetations was pretty but blocking the volcano view from our room. Very Nice view of the volcano. Good breakfast. Nice pool with hotsprings and bar. Comfortable bed. Fridge, TV, AC, Wifii. Good service. Close to the town (Better to have a car). Really nice place to stay very quiet and peaceful . Lots of birds to watch . You need a car for this location. I would stay here again. Pillows not so good, 2 of them had covers on made of satin matching the bed spread (not sure if clean) so we changed them for white cotton ones. The food was not good. Breakfast awful and my partner found hard plastic pieces in her pancake. Food generally of a very poor quality. So I would stay there but eat out. 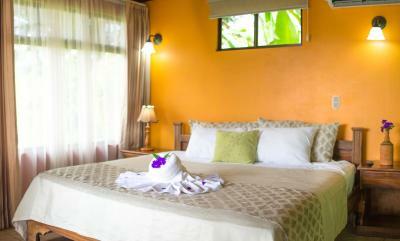 Good location, lovely pool and hot spring with swim up bar. 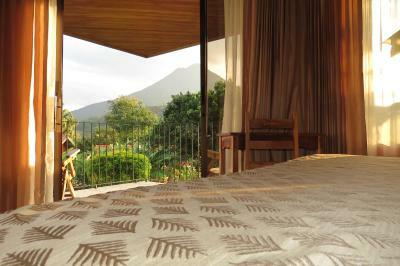 Nice rooms with views of the volcano. Good bar and cocktails. Close to the parks and lake. Go on the Bogarin Sloth trail just a few km's away, it's excellent. The rooms, staff and the grounds were very nice.